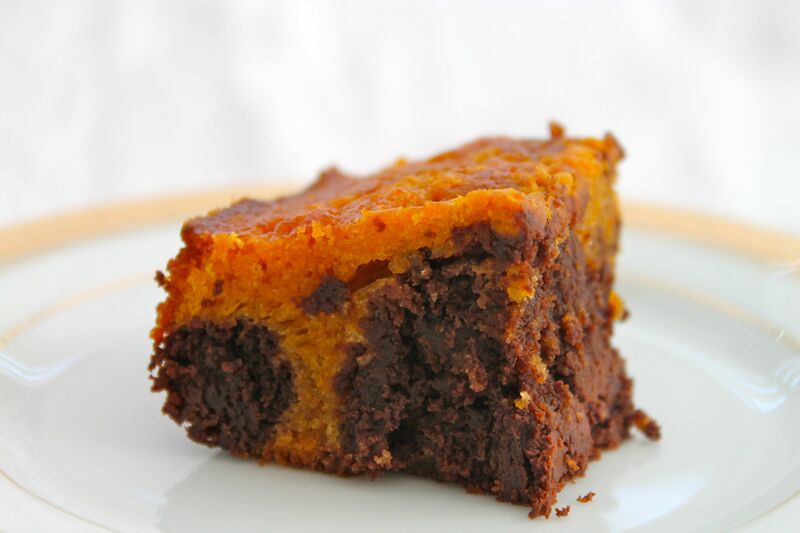 After the Pumpkin Spice Cake and the Whole Wheat Pumpkin Muffins, here’s my last pumpkin recipe to share with you: Pumpkin Brownies! I’m not sure what goes better with pumpkin than chocolate. After looking through a million versions, I finally settled on a recipe from Delishhh.com. I thought these were exceptional, and the addition of Ghiradelli chocolate chips was a stroke of genius. They were slightly more cake-like than fudge-like, and while I usually prefer the latter, they were amazing. Especially when warmed and topped with a scoop of ice cream, which I must admit I enjoyed probably 5 out of 6 nights last week. As I mentioned with my previous pumpkin recipes, I used pumpkin pie filling instead of regular pumpkin puree, which the original recipe called for. But I think you’re good either way — the pie filling makes the brownies a little sweeter and richer in the end. I baked these in my brand-new Bake and Store Baker from Crate and Barrel — a highly convenient wedding gift. After they cooled, all I had to do was snap the lid on and throw them in the passenger seat to take to a party. Perfect. Oh, and by the way — one can of pumpkin pie filling is the perfect amount for this recipe, Whole Wheat Pumpkin Spice Muffins, AND the Pumpkin Cake with Spiced Buttercream. Just to give you a heads up there. Pre-heat the oven to 350 degrees and spray an 8×8 inch baking dish with cooking spray. In a bowl, whisk to combine flour, baking powder, and salt. In a separate bowl, mix together melted butter, sugar, and vanilla. Beat in each egg one at a time. Add in the flour mixture a little at a time, and mix until combined. Divide the batter in half evenly into 2 separate bowls. In one of the bowls, blend in the cocoa powder and chocolate chips. In the second bowl of batter, stir in pumpkin pie filling, cinnamon, cloves, and nutmeg. Bake in the oven at 350 degrees for 40-45 minutes or until a toothpick inserted into the center comes out clean. Cool and cut into squares. One of my favorites! So addictive! Great post! These sound (and look) sooo good!!! Thanks! Let me know how it turns out if you make some! Oh my gosh these look delicious! I’m obsessed with pumpkin! 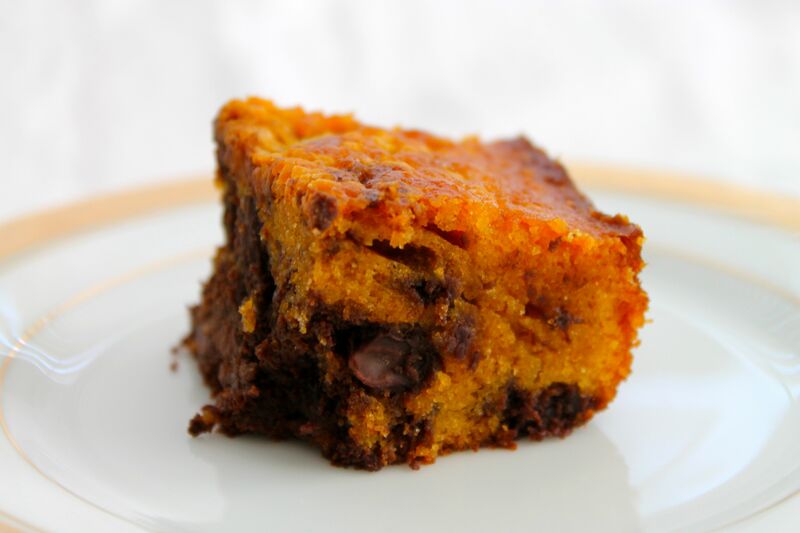 oh, a combi of two of my favorites: pumpkins and chocolate. Looks delicious. Do come and share the recipe at our linky party, at http://www.finecraftguild.com/party-3/ Our readers would love to find you. Shared. Thanks so much for the invitation! Those look so yummy! I think i have to try!